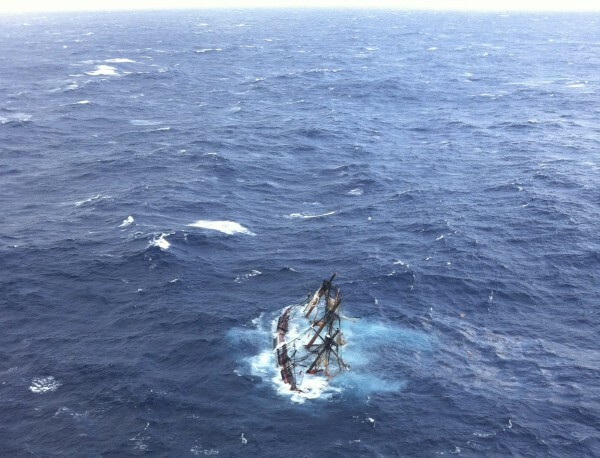 The HMS Bounty, a 180-foot sailboat, is shown submerged in the Atlantic Ocean during Hurricane Sandy approximately 90 miles southeast of Hatteras, N.C., in this U.S. Coast Guard handout picture taken Oct. 29, 2012. Capt. 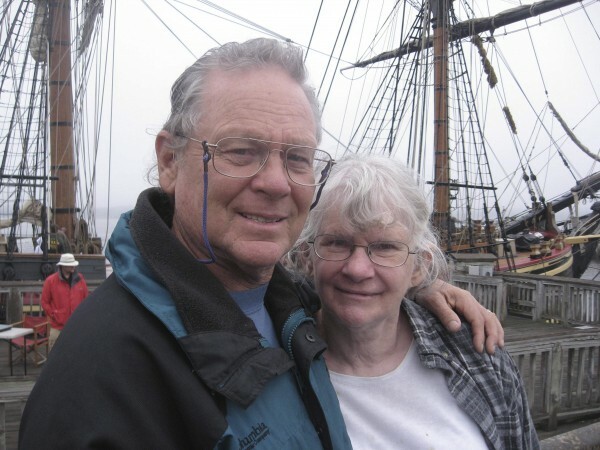 Robin Walbridge with his sister Lucille Jansen in front of HMS Bounty, at Fall River, Massachusetts is seen in this May 2010 handout photo courtesy of the Walbridge family and supplied to Reuters Nov. 2, 2012. BOOTHBAY HARBOR, Maine — Crew members of the ill-fated Bounty tall ship used inadequate caulking and opted not to replace rotted sections of the wooden hull, despite concerns expressed by Maine shipyard workers just weeks before the famous vessel sank, according to a federal report released Monday. However, the National Transportation Safety Board determined that 63-year-old Capt. Robin Walbridge’s “reckless decision” to set sail into the path of a hurricane was most to blame for the ship’s demise. The 52-year-old reconstruction of the 18th century British Navy ship was a star Hollywood vessel as a seafaring stage for Marlon Brando’s 1962 film “Mutiny on the Bounty,” Charlton Heston’s 1989 movie “Treasure Island” and — most recently — the Disney “Pirates of the Caribbean” hits starring Johnny Depp. The Nova Scotian-built ship was well-known to Maine audiences beyond its place on the big screen, with several publicity visits along the state’s coast over the years, including 2012 stops in Eastport and Belfast, and a 2010 stay in Bath. On Oct. 29, 2012, the 108-foot-long Bounty was destroyed by Hurricane Sandy’s 30-foot seas and 100-mph gusts, and sank off the coast of North Carolina. One member of the 16-person crew, 42-year-old Claudene Christian, died in the incident and the longtime captain, Walbridge, was never found and presumed dead. Another 14 crew members, including 34-year-old Aroostook County native Jessica Black, were saved by rescuers. On Monday, the National Transportation Safety Board released the findings of its investigation into the high-profile sinking, including details about what may have been substandard repair work in Maine just a month before the wreck. According to the board’s report, workers at the Boothbay Harbor Shipyard — where the Bounty pulled in for regular maintenance and repair on Sept. 17, 2012 — expressed concern about the caulking compounds provided for the work by Walbridge, as well as sections of the wooden hull that showed signs of rot. The board found that, while the work took place at the Maine facility, the work was supervised by Walbridge and largely done by the ship’s own crew members, the majority of whom had less than six months experience aboard the vessel. The report goes on to state that although the Boothbay Harbor Shipyard workers called the caulking and resealing “adequately performed,” they did question Walbridge’s choice of three seam compounds — “none of which was recommended for water immersion/marine environments,” the report noted. The board also found in its investigation, which included extensive interviews with crew members and shipyard workers, that “several areas of the wooden hull were found to have rotted,” a fact flagged by shipyard workers during the ship’s time in Boothbay Harbor. A representative of the shipyard told the Bangor Daily News on Monday evening Boothbay Harbor Shipyard officials have yet to review the report and are not yet prepared to comment on it. While an inexperienced crew and incomplete repairs may have made the ship more vulnerable, Walbridge’s choice to set sail into the path of a hurricane was most to blame for the ship’s wreck, the safety board determined.